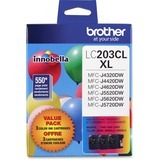 High-yield ink cartridges produce crisp and professional results in Brother MFC-J4320DW, MFC-J4420DW, MFC-J460DW, MFC-J4620DW, MFC-J480DW, MFC-J485DW, MFC-J5520DW, MFC-J5620DW, MFC-J5720DW, MFC-J680DW, MFC-J880DW and MFC-J885DW. High capacity is perfect for high-volume printing. Innobella ink technology offers print longevity, richer colors and sharper images. Innobella ink is fade-resistant and color-fast to deliver high-quality images that stay vivid for years. Each color cartridge yields approximately 550 pages.